My dear readers and fellow daring bakers - I have SO SO SO much to tell you, and I'm a day late for the Daring Bakers (I just typed Darting Bakers, which was a typo, but in retrospect seems appropriate) monthly post, too - but the last four days have been a culinary whirlwind of sipping herbed granité at the Food, Body, Planet benefit, snapping food photos for Pure Food and Wine, selling cheese at New Amsterdam Public's sustainable/regional market, and baking an honest-to-goodness wedding cake (and creating floral arrangements!) for my best friend's wedding last night. My blog is struggling to keep up with all that! 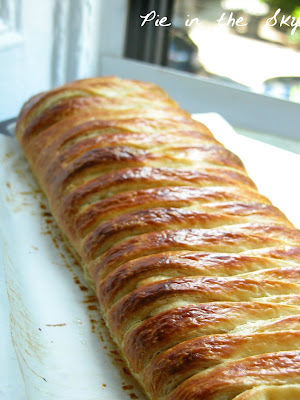 So for now, here are a couple of "teaser" shots of my Cream Cheese Danish Braid, made for the Daring Bakers' June Challenge, with more - and yummier! - images to come with the full post. If you just can't get enough, check out the Daring Baker's blogroll (not sure how recently updated that site is - our new site is under construction) to see many other braids - wonderful work, bakers! Thanks for the post! Your braid is perfection. Can't wait for more posts to come, especially about taking food pictures for a restaurant! That sounds glamorous and exciting. :) Anyway, I love you, my dearest friend, and love reading your blog. Come visit in Chicago soon! What a perfect little thing! That icing runing over it is amazing! You never cease to amaze me. Thank you! Look how lovely your braid and the glaze look! Well done. 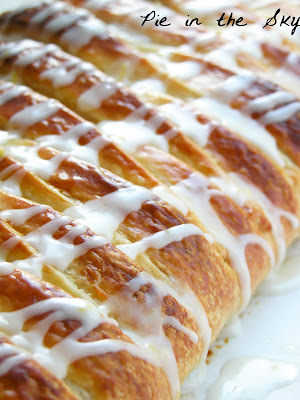 I really like the idea of the braid, it adds character to this special pastry. I'm not sure that I'm going to make it again any time soon, but I'll definitely put this recipe to use when friends and family come to visit. This smells heavenly when it's baking Imagine visiting a friend or family member and waking up to the smell of a fresh baked danish pastry made.